People need to rise up like they did in 1969 and go to the capital and demand changes, but I’m afraid that will never happen. West Virginia doesn’t have anymore statesman like Ken anymore.. Sadly, our state doesn’t elect politicians of Ken’s caliber anymore. Ken helped coal miners, like my grandfather, get black lung benefits. Evenso, my Grandpa Frasher had difficulty making his case. He was initially told his lungs were damaged because of smoking, although he never smoked a day in his life. He did eventually get his benefits, in the 1970s, and lived to watch as miners with black lung during the Reagan era found it nearly impossible to get help. What will Trump do? I hope I’m wrong, but I fear the Donald will make the Gipper look like a saint. ignoring the toxicity of coal and its production has been the outcome of a successful propaganda champaign of the coal industry. The greed and arrogance of coal barons is tragic, but even more condemning is the apathy of citizens and the collusion with government agencies. So who dropped the ball here? If I am reading this right, NIOSH is either negligent in its duty or is hiding the very real problem that should have been caught and rectified way before now. Big difference between 99 and 962. It would also seem the clinics may not communicate with each other either. With today’s technology, no excuse period for this information not to be known. Is “Clean Coal” just a propaganda slogan? In theory Black Lung for miners, and respiratory damage for the populations who just breath the air in the vicinity of mining, and from air pollution from burning of coal, are preventable damages. In theory miners and everyone else in coal country can have health benefits, guaranteed by the government. In theory CO2 can be captured and disposed of. But in practice, these things are thought of as too expensive to fully pay for, either by the coal companies, electric power companies or taxpayers, so the burden remains on those who suffer the damages. So, if “Clean Coal” is not reality, and “Dirty Coal” is being replaced by cleaner, cheaper alternatives, then why all the sorrow that coal is on its way out? The UMWA has always tried to support coal miners health and safety. One only needs to look at their long history of doing just that. They support and back only the candidates that would be on the side of keeping safe jobs available for coal miners. When mining coal in an underground environment it is virtually impossible to eliminate all the dust created by mining methods. However it has been greatly reduced from earlier years of mining. With that being stated it is still a work in progress to continue seeking ways of reducing this hazard. Mining by its very nature is a hazardous occupation but yet a vital industry that I hope as stated by the new incoming administration will be expanded and protected. 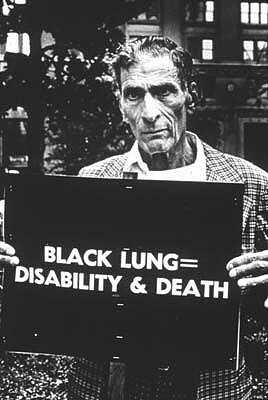 After 23 years of fighting for my Black Lung Benifits, I am have become more discouraged about the future of the Federal Black Lung program then ever before due to the reduced work force and law makers insensitivity to this terrible disease to look at the scientific evidence of the many different kinds of diseases that cause coal miners to suffer to breathe! Law Firms become rich while Coal Companies reap profits and miners die! Does anyone care anymore!! !